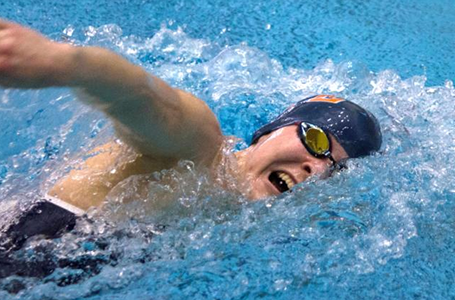 Hope College is hosting the 2015 Michigan Intercollegiate Athletic Association Women's and Men's Swimming & Diving Championships at the Holland Community Aquatic Center in Holland, Michigan. The four-day, six-team meet runs from Wednesday-Saturday, February 11-14. The Championships will begin on Wednesday, February 11, at 7 p.m. with the 800-yard men's and women's relay finals and men's 1-meter diving preliminaries. On Thursday, February 12, Friday, February 13, and Saturday, February 14, preliminary heats for all swimming events will start at 10 a.m., with event finals starting each night at 5:30 p.m.
Access a full schedule, directions, ticket information and more. The Hope College women's basketball team has relished being fans at DeVos Fieldhouse a few times this winter. Hope College staff members were recognized for service during the college’s annual service award luncheon, held on Friday, Feb. 6, at the Haworth Inn and Conference Center.